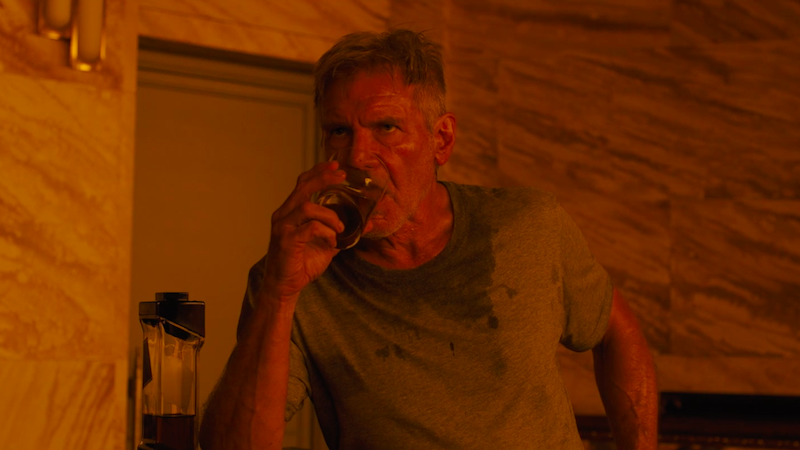 Last week, we learned that if Harrison Ford punches you in the face on set, he will also give you a booze to apologize. Now, there’s a special branded whiskey he can give to Ryan Gosling the next time he hits him in the face. Of course, the real tie-in is that the original Blade Runner from 1982 has a scene of Deckard being called into his boss Bryant’s office where the men share shots of Johnnie Walker Black Label as they discuss a new case involving four replicants that have illegally travelled to earth. And now we know it’s even going to make it Deckard and Johnnie are still good friends we see hanging out together at a bar somewhere in a desolate wasteland. Hoping to capitalize on nostalgia and the Blade Runner 2049 hype, and presumably not on Ford’s story of punching a co-star and not really feeling all that bad about it, Johnnie Walker is putting out a limited edition run of its signature whiskey in a schmancy, futuristic bottle that appears in the new film. Getting your hands on some of The Director’s Cut won’t exactly be the easiest task. Each bottle will go for $89.99, but only 39,000 of them are being produced globally across 15 different markets when it hits stores later this month. Do Androids Dream of Fine Whiskey, Neat?